The first weekend of 2007 didn't offer much in the way of new quality films, and although the Martin Luther King Jr. holiday weekend shows some improvement, we're still left to rely on returning and expanding films for the best quality of the frame. Of the new releases, Stomp the Yard leads the way. 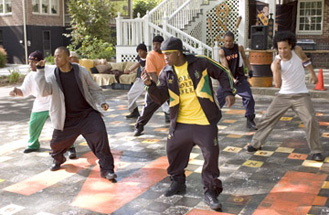 It's a movie that centers on the tradition of step dancing (aka krumping), popular at traditionally black colleges, but little known elsewhere. Starring a collection of young rappers, choreographers and a few up-and-comers, Stomp the Yard looks like a cross between 2002's minor hit Drumline and last year's Step Up, with maybe a little bit of You Got Served in for good (bad?) measure. The main, or perhaps only, attraction here is the high-energy dance scenes. Critics have not been kind to the rest of the film, with its soap opera-quality plotting and acting singled out for specific criticism. Even at that, this isn't a film that is dependent on reviews for its core audience, who will be going for the dance numbers. However, a cross-over appeal can pretty much be written off. Opening on about 2,000 screens, look for a weekend total of just under $10 million.